This was a NetGalley title and I was previously unfamiliar with Bloomsbury’s Object Lessons series. Besides the cover, what caught my attention was that the author was Rolf Potts, whose work I’m familiar with and have quite enjoyed. Souvenir did not disappoint. In a short, novella-length piece, Potts covered the history or souvenirs from religious relics to “13 tons of contraband Eiffel Tower kitsch!” which were confiscated by Parisian police. The way he looked at things such as a possibly authentic Shakespeare chair in a similar vein to the religious relics – who knew how many sets of a saint’s bones had been found-was fascinating. I’d recently had a thought about some made in China souvenir I’d picked up and how souvenirs had, in some ways, lost their connection to what they depicted. But as he also addressed, the souvenir might be about the physical object, but it might be about the memory of where the object came from. I personally am more likely to keep the found items type of souvenirs: ticket stubs, museum brochures and the like, but there are items such as a flamenco poster from a 1996 trip to Spain that I remember the exact moment of purchase. I liked how he traced the history of post cards, once called postal cards. 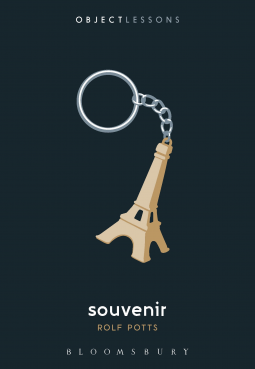 They are, for me, the type of souvenir buying that has changed the most over time. At first, they were cheap and I enjoyed sending them to friends & family back home. Plus the photos they were with were much better than something I could take with a film or early digital camera. Then I wasn’t sending them as often and sometimes felt “I could take a better version of that photo”. Recently with the advent of drone photography, it’s back to “wow, I can’t get that photo”. I don’t always send them, but rather use them as photo memories of a trip. This is also true of items in a museum which maybe didn’t allow photography or the light was too dim to get a good one. I also really liked how he used his own souvenirs to tell the broader story of what made a souvenir. These ranged from a “seashell” he collected on a trip where he first went to the beach as a child, to a fuse box pilfered from (and later returned to) a plane crash in Colorado as a teen, to theater masks collected while traveling in Asia. This also allowed him to explore the intersection between souvenirs, museum collections and the evolution of museums today, another area of personal interest to me. All in all, a wonderful, quick read. I look forward to reading more in the Object Lessons series as I think this is a wonderful vehicle for exploring the everyday world. Just remembered to come back to this – I have sent my review off to Shiny New Books but it’s not come out yet. I will link to it on my blog when it does. I really enjoyed the mix of history, philosophy and his own life story telling and I hadn’t read anything by him before, so didn’t know what to expect. Will definitely look out for more of his work. Funny, just was wondering if you’d had the chance to read it yet when I was clearing out my inbox and found first comment notification. HIs stuff is of varying levels of engaging. You can usually find used copies fairly cheap, his Vagabonding is forever in op shops here. Oddly I loved this, luggage was OK, Burger was meh and I gave up on the series.